DirectX 12 for Windows 10 64 Bit: DirectX 12 was announced by Microsoft on 20 March 2014, and official launch of DirectX 12 along with windows on 29 July 2015. The company was expected to feature on XBOX One and Windows mobile.2014 Microsoft DirectX is a collection of technologies designed in ideal platform to run the applications like games, full-color graphics, audio & video in blue ray movies and 3D animation. 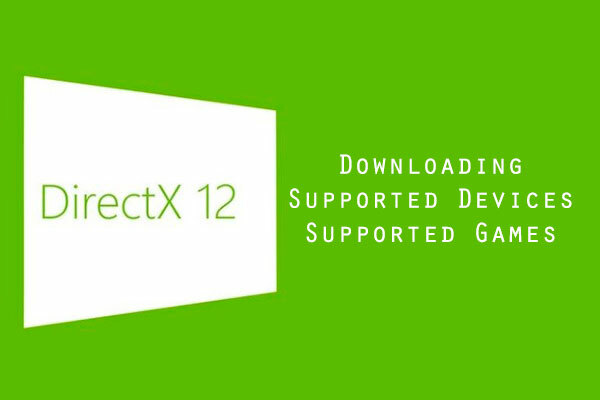 DirectX 12 has the ultimate features for 3D Blue Ray movies, direct & 3D sounds. The Intel group declared that latest version of DirectX works 50-70% more efficiently and accurately as compared to its previous versions. This new version has the ability to consume less energy of 3D media in laptops and also accelerates the graphics, while playing games and 3D movies. This allows more efficient resource utilization through parallel computation. While portraying games on your system and also reduces the cpu usage. The major Thing that separated DirectX 12 from its previous versions is Low Level Hardware Abstraction. Direct3D – this will vastly increase the opportunity for developers to control their games for specific hardware components. This is the job of Direct3D which offers a lower level of hardware abstraction and reconfigures how the graphic pipeline is controlled when compared to DirectX 11 and previous versions. Hardware Extraction is the root for making to use the API rather than developers having to write the code again to deal with different hardware and drivers, the API maintains all of that stuff and helps developers in having a simplified set of instructions code. NOTE: Nvidia promised that GeForce 400 and 500 series will also get the compatibility update soon. New release of direct x is available for windows 10 and not available for previous versions of the windows. There is no update available for windows7 and windows 8, 8.1. If you want to experience the games with New Directx 12 Then update your pc to windows 10 operating system then try.